Why break up ceramic figurines to use the pieces in mosaic artwork when you can use the whole figurine? Artist Laurie Gilson emailed me some photos of her recent work, and they are great examples of how you can use ceramic figurines in your mosaics and still use standard elements such as tile arranged in rows. 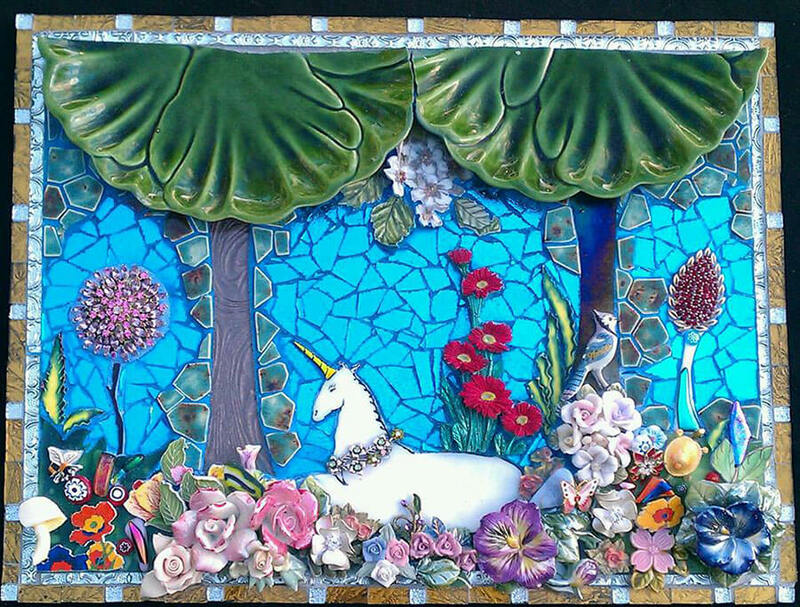 Unicorn Mosaic Laurie Gilson. Note the border is part of the mosaic, as was common in ancient Roman mosaics. 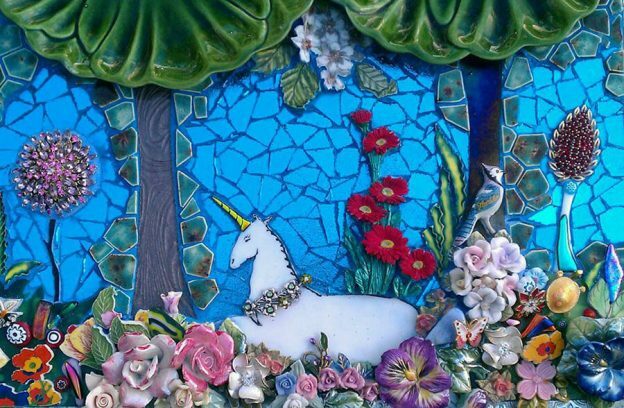 In Laurie Gilson’s “Unicorn Mosaic,” ceramic flowers of different type were used to create a “Garden of Eden” setting that is just right for the mythical beast. I love the blue jay and how the lily pad plates were used for the foliage of the trees. A wet saw (powered saw for cutting ceramic tile) would be the best tool for cutting a plate evenly in half, especially if it has rims or folds like the lily pad plate does. Note that compression tools like Tile Nippers aren’t practical for making long straight cuts like that. Note how the background is flat monochrome blue, which is essential for having the multicolored flowers stand out. Even the solid white unicorn probably wouldn’t stand out very well if the background was multicolored. All that being said, Laurie used our Ceramic Break-Off Tiles to transition from the dimensional figures to the flat background. Seahorse Mosaic Laurie Gilson is a favorite of mine. The swirling waters is rendered in concentric curving rows of alternating materials is a great teaching example of andamento used to create a sense of motion. I love the green teal colors of the water and how they are perfect compliments of the muted oranges of the sea shells. 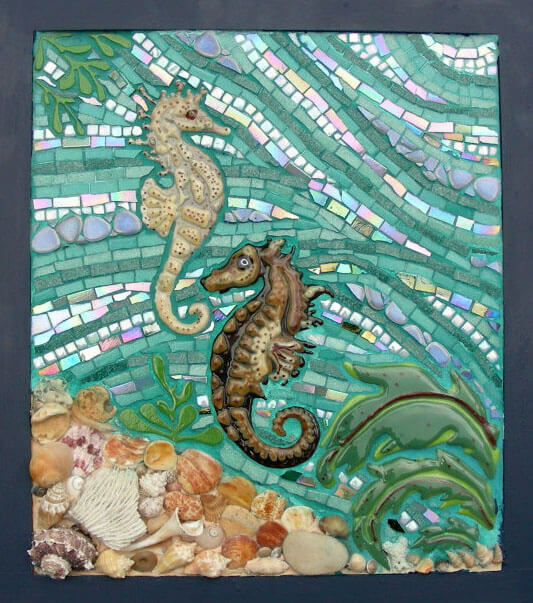 An earlier work by Laurie, “Seahorse Mosaic” is a beautiful example of how you can have conventional andamento (arrangement of tiles in rows) in a mosaic that makes use of bas relief ceramic elements. 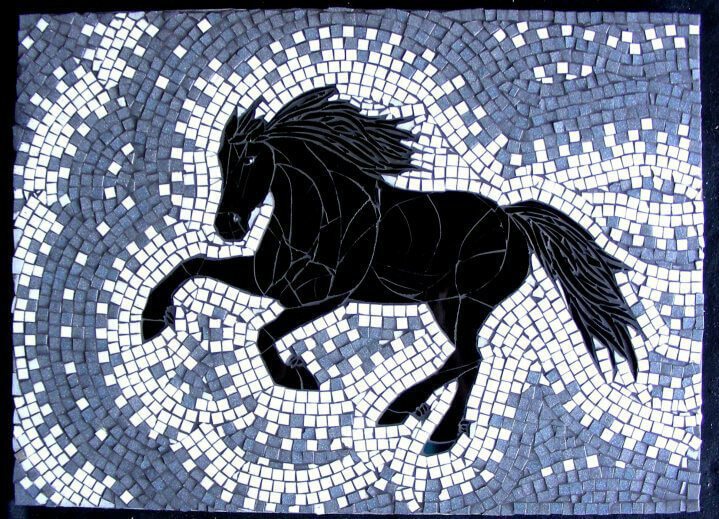 Laurie’s “Horse Mosaic” below also uses traditional concentric andamento to create a sense of motion in background, but in this second work, the figure is executed in stained glass in a mode more like stained glass artwork (fitted pieces representing whole components of a figure) than the mode of conventional mosaic (tiny pieces of similar size used to build up components). The horse’s tail and mane are notable exceptions to that last statement. Marilyn uses a variety of materials to make her sculptural mosaics, including wood and particle board and stuff we preach and rant against all the time, at least for outdoor and wet locations. The reason we rant against that stuff is that it only takes a little water coming in through a pin hole in the grout, and then the wood swells and splits, and then the mosaic falls apart relatively quickly. Of course, if your mosaic is dry and indoors, you can use wood and plywood as a backer without any worries. Marilyn pre-seals her wooden bases with Weldbond mosaic adhesive and grouts thoroughly. She also seals the finished mosaic with multiple applications of a tile and grout sealer. If you are not absolutely certain that you could be this thorough in your work, then don’t even consider using wood as a base. If you think you CAN be this thorough, then keep in mind that it only takes a pinhole for humidity to get to the wood and expand it. We get emails from people all the time who are upset about how quickly their outdoor mosaic on wood fell apart. Our article on Mosaic Lawn Sculptures discusses some more reliable alternatives to wood. Save wood for indoor use only if you want to be sure. 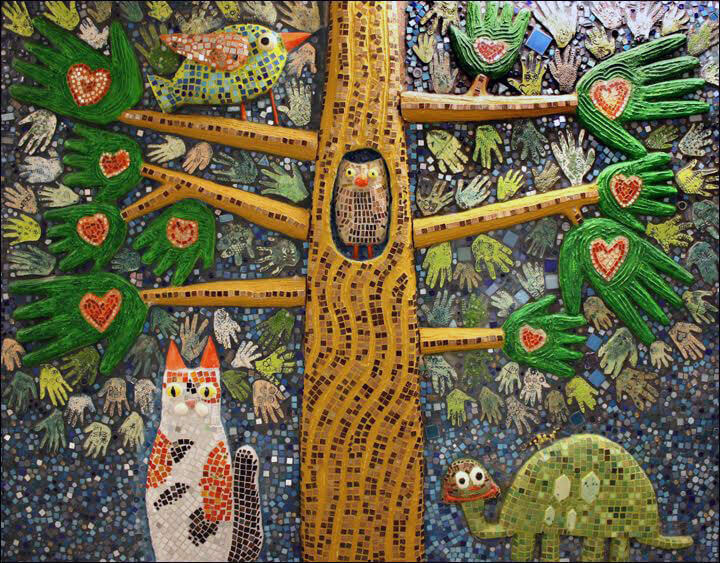 This entry was posted in Art Review, Improving Your Art, Inspiration and tagged ceramic tile, contemporary mosaic, fun project, sculptural mosaic on November 19, 2017 by Joe Moorman. Enjoy the blogs on artists and their works. Wondering if you have have recommendations of sites to purchase ceramics figurines? Ebay and thrift stores and yard sales are the best sources. How do you grout a piece with figurines incorporated into the design?? Are there some tricks you can pass on? Or is it pretty much the same, just being much more careful where your grout goes. I can’t even image trying to clean grout from some of those figurines! You would press these objects into a bed of thinset mortar instead of glue-then-grout. Some smooth figurines take grout just fine. If your piece is delicate and might not clean well from grout, then cover it with sticky tape or even Press and Seal before grouting. Saves a lot of clean up time! I have several small vases and trinket boxes that are decorated with capidomonte 3d flowers. I’d like to use the flowers like the artist did in the unicorn mosaic. How do i remove these 3d elements in tact? I’m not familiar with those boxes. If the boxes are ceramic or porcelain, then cutting them with a nipper is likely to break the flowers, and so a wet saw (power tile saw) might be needed.